About 2 weeks ago we received the Xootr Swift to test and review. 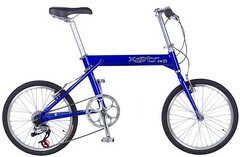 As for our first impression, this foldable bike scores high on style, functionality and performance. Once I got the Swift, I showed it off to my co-workers and even rode it around the office. After being scolded by a manager, I took it out side for a little spin. When I got home I took out the Swift again around the neighborhood for about 6 miles. The Swift gets some major attention from motorists and people walking by. When I show it off to my friends, all they can say is, “Whoa, that’s so cool!” So far she’s a winner! Too early to tell, but so far she’s got a clean bill of health. The only thing I can’t find is any info from the site that talks about the weight limit. A few of my buddies at work are a bit on the big boned side and wanted to try it, but I wasn’t sure if the Swift could handle it. So stay tuned for more postings about the Swift. You can find more information on Xootr’s Site.